My DD want a picnic quilt. She just wants star in the center with 1 outside border. I am making it 60" sq. I think that I want 24" center square 8 points for a typical star. I think I need to cut center 24", 12 7/8" sq out of 2 fabrics to make 1/2sq Triangles (4) and 12" with SQ for the corners. Add 6" border so finished size would be 60" does this math sound correct? How about an easy Carpenter Star, finishes about 50" square? If you would be interested, PM me for the instructions. I also vote for the Carpenters Star. Also, Jenny over at Missouri Star Quilt Company has a tutorial using a layer cake to make a very large star. Great ideas ladies but not what DD wants. She wants is a bacic 8 point star (like missouri star logo) large in the center with only 1 border. I have made carpenter star several time and reallty like it but that is not what she wants. Actually it is like only 1 really large block (24") with one 6" border making it 60"sq. Do you think my math is correct? I think you're almost correct for the simple star that's made with a center square and HST's forming the points, squares in the corners. 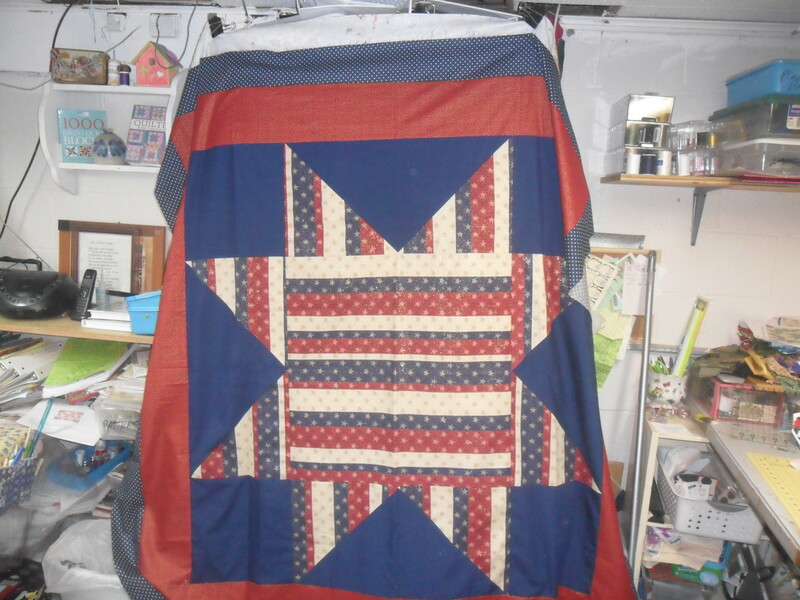 If you want the center block to be 24" finished, then one finished 6" border only makes the quilt 36". I think you meant to make the center block 48", and (as you said in the first post) the center square in that block will be 24". If that is the case, cut your center at 24.5", and you will need 8 (rather than 4) HST's, with the squares cut at 12 7/8". (I would cut at 13" and trim down instead.) Cut your corner squares at 12.5". Your border needs to be cut at 6.5". How strange that your daughter wants such a simple quilt, but much easier for you! The Missouri Star logo is actually more complex - are you sure that isn't what she wants? I was almost right but I forgot the 1/2" for seams. star sound plain but we got striped patriotic fab for Joann's with blue background and red polkadot for border. Should be cute! (I love easy) Will post when done! Thanks Dunster for the heads up about the seam allowance. Dunster is ALWAYS so GREAT with Math problems. The board should award her the title SUPER "MATH" MEMBER. You are the greatest !!! here is the finished (but not yet quilted) picnic quilt that my daughter wanted. It is now 68 x68. She has seen it and likes it! Hope she invites me on a picnic!!!! !